The iPhone App Store is starting to get overrun with useless apps, and this is one of them… but you gotta admit, it’s kinda funny! Wooo Button does one thing and one thing only: it screams WOOO! at you. If you’re fortunate enough to have your iPhone on mute it won’t do anything at all, but for the rest of us it will scream and scream until you stop pushing that annoying Wooo! button. If you’re suffering a temporary (or permanent) loss of speech for whatever reason, download this app immediately and make your wishes known every time a college cheerleader offers to give you a massage. Thanks, Aaron Berk. Your contribution to modern civilization will be remembered for generations to come. This app still makes my wife laugh on a weekly basis. 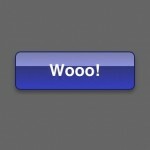 This is “Woo!” is WELL worth the time and its FREE. A must have. Ha, yeah Aaron is a true pillar of society! Really, developers like him are the ones who keep the app store interesting. I’m all about supporting the small independents. This one can be best used scare little kids, and make others laugh when they are dull.